The great helm is, perhaps, one of the most iconic helmets in medieval history. It possesses a well-known form that is loved, and used, by many who participate in reenactments. 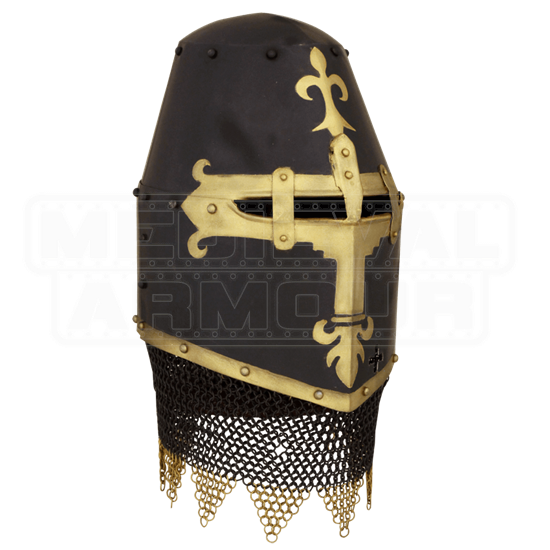 And this 14th Century Dark Knight Helm adds a twist to the classic design. Like the classic great helms of antiquity, this recreation features a round, partially cylindrical shape that, when worn over the head, wraps the skull in steel for complete and total defense. This particular model is a bit narrower at the top, with a rounded cap that circumvents the flat top of the earlier models, allowing a better transfer of force from the top, down to the sides of the helm. The helmet is also noteworthy for its general design, as it is crafted from mild steel with a dark, blackened finish. Bright brass accents wrap around the narrow eye-slit in the front, creating a gilt cross pattern capped with ornate fleur de lis icons on the top and bottom. 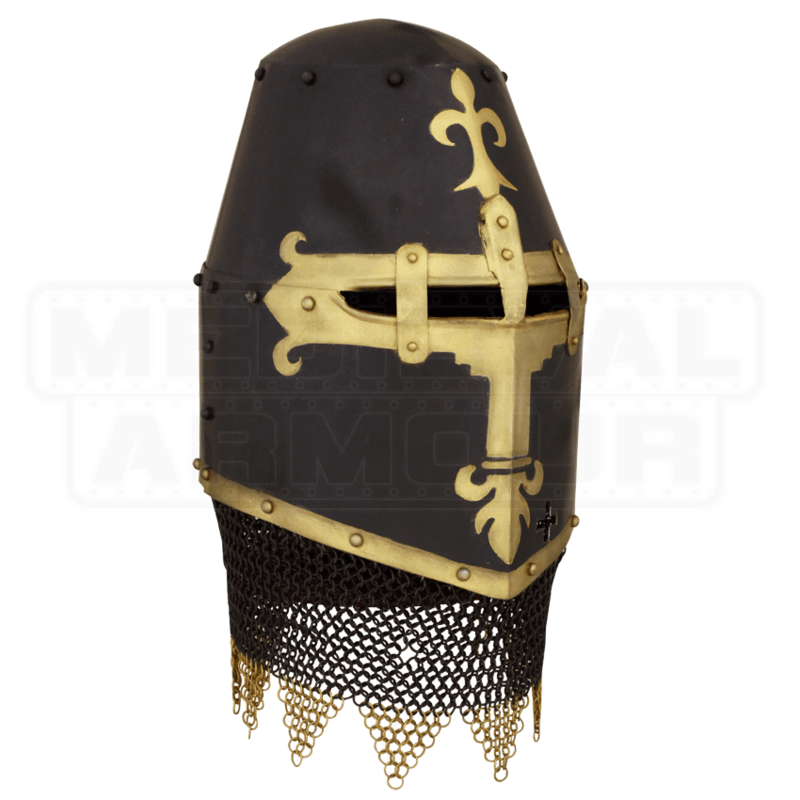 The edge of the helm is equally accented with brass metal and rivets, while a mail curtain hangs from the bottom edge, touched with matched dark and brass metal finishing along its jagged edges. Best of all, the helmet is offered in two models - the 18 gauge is lighter and made for costuming, collecting, light combat and LARPing, while the 16 gauge is heavier and more suited to the rigors of reenactment, SCA events, and more heavy combat scenarios. Based on a piece out of the National Museum in Nurnberg, Germany, this 14th Century Dark Knight Helm is more than just a richly detailed piece of armor to wear. It is also a piece of history, to be worn, displayed, and enjoyed by enthusiasts the world over.